I ran across an interesting article in a past issue of Old Cars Weekly. "The Auburn Cord Duesenberg Museum can now earn a penny each time hobbyist search the Internet. GoodSearch.com is a search engine company that donates half of it's revenue, about a penny per search, to the charities it's users designate. The search engine is powered by Yahoo and will pull up the same quality search results that you are use to, only the museum is earning money every time you search the web." 1937 Cord Back Home Again! After seventy years, Errett Lobban Cord's 1937 Cord 812 Beverly Sedan has returned to the former Auburn Automobile Company in Auburn, Indiana, now the Auburn Cord Duesenberg Automobile Museum. This Cord is believed to be the last Cord delivered by the Auburn Automobile Company. 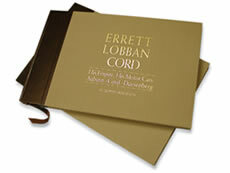 It was delivered to E.L. Cord's Beverly Hills, California Estate, "Cordhaven" in November of 1937. Mr. Cord used the car throughout the 1950's before giving it to his son, Charlie Cord. Charlie Sr. later passed the car to his son, Charlie Cord Jr. The car remained in the Cord family until the decision was made to donate it to the ACD Museum this past November. Everyone dreams of finding that Rare and Valuable Old Car that has been locked away and long forgotten about in someone’s barn or warehouse. You would think by now that all of these treasures would have been discovered… well that is not the case with two recently discovered Auburn Speedsters. At the March Board of Directors meeting of the Auburn Cord Duesenberg Club. A motion was made an d voted on to rename the "Replica" classification for shows. Replica ACD cars displayed at the 2009 Auburn Indiana National Meet will now be referred to as "2nd Generation" Cars. The Antique Automobile Club, last year, also created guide lines for a 2nd Generation Car classification. AACA guide lines are more defined than the ACD clubs at this time. This years ACD Club's National Meet and the ACD Festival will again be held over the Labor Day Weekend in Auburn, Indiana. It is not too early to start planning your trip. Hotels fill up fast in Auburn but there should still be plenty of vacancies in nearby Fort Wayne. There is no other show quite like Auburn. The event takes place over 5 days, the ACD Clubs Classic Car Show is Saturday. Bring your car... better yet drive it to Auburn, display it in the show, drive it in the Parade of Classics. Visit our Road Trips & Travel page to view photo's from last years show. Use the following links to start planning your trip now. "2009 Ault Park Concours d' Elegance"
Not exactly ACD related, but definitely of Interest... We recently visited two Car Museums honoring two American Icons. One being The Citizens Motorcar Company - America's Packard Museum located in Dayton, Ohio. The Birth Place of Aviation is Dayton’s Claim to Fame, but to the Classic Car enthusiast, Dayton is home to America’s Packard Museum. At the corner of Ludlow and Franklin Streets the Packard Motor Car Company lives again. The Museum building was a former Packard dealership in 1917. We also visited The National Corvette Museum in Bowling Green, Kentucky. The National Corvette Museum celebrated it's 15th Anniversary this past September. The Museum tells the story of the Corvette and the Love Affair with America's Sports Car through the use of Beautifully detailed exhibits and displays. Earlier this year the Museum completed a 46,000 square foot expansion, which included the long awaited Corvette Research Center, Library and the Corvette Cafe. Browsing through the Auburn Cord Duesenberg Club website over the Holidays, I ran across a couple of items of interest. The first being the wonderful collection of vintage ACD photographs that were so generously don ated by Joyce Brockman. The photo collection belonged to her late husband and long time Canadian ACD Club member, Jim Brockman. Jim was known as the ACD Canadian Historian. The collection of photo's date back almost 50 years. ACD Club member, Mike Huffman was kind enough to scan the hundreds of vintage photo's so that they could be posted on the club website. Actually Jim has earned his own page, The Jim Brockman Collection. Use this link to view all of his photo's. Another new addition to the ACD Club's website is the Reunion and Meets page. It takes on a totally new look with great graphics and photo's. I hope this is a preview for the future look of the entire website. From this page you can read about the ACD clubs history, view photo's from last years meet, keep track of up coming ACD events and more. Nice work Guys! The next time you need a Rental Car and are looking for something a little different... Why not Rent an Auburn Boattail Speedster. You may also want to consider renting one if you have plans for a future purchase in the works. Cruising around in one of these Modern Day Classics just might seal the deal for you. Mecum's Indy'10 Spring Classic was a Duesy! It is a small to wn where Chrome and lots of it, is found along with "Stylish" Cars Rolling on BIG Whitewall tires. As a matter of fact only OLD Cars are allowed on the streets of Elgin Park. You will not find Elgin Park on any map. This small town was created by Michael Paul Smith. This is the kind of place that only seems to exist in memories and on the pages of photo albums. 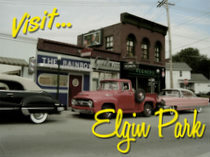 Elgin Park is a 1:24th scale collection of Automobiles, Streets and Buildings. This wonderful town lives through Smith’s life-like photos. The Kruse Auction Park in Auburn, Indiana has been sold to, Auctions America, a subsidiary of RM Auctions. Canadian based RM Auctions is a leading Collector Car auction company. There was speculation that the traditional Auburn Classic Car Auction, held in conjunction with the Auburn Cord Duesenberg Festival each Labor Day weekend, would not be happening this year, thus ending a 40 year tradition. RM announced that there "WILL BE" a 2010 Auburn Collector Car Auction and they are now taking consignments. 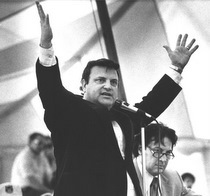 Long time auctioneer, Dean Kruse started his annual Auburn Classic Car Auction in 1971. The original auction was held in an empty field, later they would move to a high school stadium. His Auburn Classic Car Auction continued to grow and would later be promoted as the largest Collector Car Auction in the World, advertising 5000 cars being offered for sale. Dean Kruse eventually would build and complete his dream auction park in 1989. Located right off of the I-69 exit to Auburn, the Kruse Auction Park consisted of 230 acres, and was the location of Kruse International's World Headquarters. With the great success of his company, ebay took notice. They purchased the Kruse Auction company is 1999, keeping Dean Kruse on to over see the transition. ebay never quite got it right, it was not the same as when Dean was at the wheel. Four years later, ebay would sell the company back to Dean Kruse. Kruse immediately made many needed changes to the Fall Auburn event. Things were better than ever with Kruse in charge again. According to automotive and business press, the past 12-18 months have not been good for this once successful company. The failing economy was to blame according to Dean. Dean Kruse said in a new conference, held right after the sell to RM of his Auction Company and Park, that selling to his long time friends at RM Auctions was the right thing to do at this time. This years Auburn Labor Day Event, will now have three Collector Car Auctions taking place. The above mentioned RM's Auctions America, the already established Worldwide Auctioneers with "The Auburn Auction" and another new player, Classical Events Auction. Consign your Collector Cars now and bring Plenty of Money to Auburn to help Stimulate the Economy. Use our link, What, Where and When to get a feel for this year’s event. Visit the ACD Clubs event website for all of the information regarding the Ab Jenkins Memorial Duesenberg Exhibition of Speed. I do not have anything to Run, but I will be there! The Auburn Swap Meet will Continue! Road Trip Photo Gallery - 4 New Additions! Be sure to Check Out the two latest Concours d'Elegance Photo Galleries that have been added on our Road Trips and Travel page. In June we traveled to the 33rd Annual Ault Park Concours in Cincinnati, Ohio and in July we visited Keeneland Race Park in Lexington, Kentucky for the Keeneland Concours d'Elegance. While you are viewing those pictures be sure and see our photo's from the AACA's 75th Anniversary celebration which took place in Louisville, Kentucky. Over 700 cars were displayed indoors with Air Conditioned Comfort! The Summer has been Hot no doubt, but so has the Car Show Action and there is plenty more to come. This month the National Street Rod Association (NSRA) will be Rolling into Louisville for their National Meet Believe it or not this event draws 12,000 to 13,000+ Street Rods. More are expected this year with cars 25 years and older now being excepted. I will be there snapping pictures, and combing the Swap Meet. I will also be checking out new Hot Rod items that are being offered from the manufacturers that can be used on our Auburn Speedsters. Watch for coverage. Be sure to Check Out our Photo's from This years Auburn Cord Duesenberg Clubs 55th Annual Reunion! With the Kruse Auction Park being sold to RM Auctions of Canada in July, everyone wondered what this years would be like. The traditional Swap Meet and Car Corral continued. There were a few empty spaces found but not enough to hurt anything. I would imagine next year will be a sell out. Judging from the Tens of Thousand Smiling Faces there is no doubt RM pulled off an incredible Inaugural Event. The new auction is known as Auction America. The Auction Park has received many updates, additional paving, new arena style auction seating and many buildings received new paint. Worldwide Auctions celebrated it's third year as part of the Auburn Festival. It is located just minutes south of Auburn. The event has now grown to three days and offered over 500 Collector Cars. Additional tents were constructed this year and were filled with Beautiful Cars. This years offering seemed to be dominated with Muscle Cars but there were Plenty of other desirable cars to satisfy everyone's interest. The 55th annual Reunion of the Auburn Cord Duesenberg Club was definitely a DUESY! Four days of picture perfect weather, hundreds of Auburns, Cords and Duesenbergs along with thousands of Classic Car enthusiast were the perfect mix for this year’s Auburn Cord Duesenberg Festival. The Reunion takes place in where else, but Auburn, Indiana. The highlight of this years ACD Club Reunion was Fridays Ab Jenkins Memorial Exhibition of Speed and Stinson Fly-In. The Duesenberg J was the honorary car for this years Reunion. At one time Duesenbergs were some of the fastest cars in the world. So what better way to honor them than to let them RUN! The Speed event was held at the Kendallville Municipal Airport. An estimated 3-4000 people made their way to Kendallville to take part in this once in a life time event. Check out our Photo's of this Duesy of an event! The Louisville Concours D' Elegance was a huge success again this year. It is a relatively new event, now in it's 3rd year, that is growing fast in national recognition and stature. The Concours was held Sunday, October 3rd in the infield of Historical Churchill Downs. What better place to display Classic Automobiles that posses the same Grace and Heritage as the Thoroughbred Horses that have Raced there. While reading through the AACA's Auburn Forum, I ran across a guy inquiring about Auburn Speedster body's... wondering if anyone has or currently does reproduce them in metal. I was not aware of anyone offering the 1935 & 1936 body's but I knew that D&D Classic Automobile Restorations in Ohio have reproduced metal 1931-1933 Speedster Body's. They also offer metal 810 / 812 Cord replacement body parts among other services. 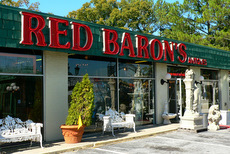 I have seen their samples Art displayed in Auburn by partner-owner, Mark Kennison. D&D Classics has a staff of over 20 skilled craftsmen. All of there work is impressive, with the most impressive to date being the recreation of the Lost Cord Show Car, the L-29 Cord LeGrande. If you have visited the Auburn Cord Duesenberg Automobile Museum in the past few years you have to leave there with memories of the 1931 L-29 LeGrande Speedster in Garish Red and Yellow. This particular Cord is a D&D Classic Recreation of the original Cord Show Car. The original LeGrande 1st appeared at the New York Auto Show. It was purchased after the show by Jean Harlow and her new husband, MGM Executive Paul Bern. They had it shipped to Europe for their Honeymoon. When purchasing the Cord it was agreed that the car would later be shown at the Paris Auto Show. The Honeymoon ended quite abruptly after a spat. The newlyweds came home leaving there L-29 Cord behind. Shortly after retuning the the states Mr. Bern committed suicide and Ms. Harlow remarried and later died in 1937 with no records of ever bringing the Cord back home. It's whereabouts are still a mystery today. Mike McCoy, played by Elvis Presley, in the 1966 movie Spinout, used a Model J Duesenberg to tow his Cobra race car in several scenes of the movie. It was a 1929 Short Wheelbase Model J Dual Cowl Phaeton, one of only two built by Derham. The Elvis Duesenberg was recently offered for auction at RM Auctions Automobiles of Arizona. The sale took place January 20-2 1, 2011 at the Arizona Biltmore Resort in Phoenix. The Car was to be sold at No Reserve, it had an estimated selling price of $900,000 – $1.2 Million. If you happen to own your own sign and graphic shop like Robert Fry does, it makes creating unique shop vans a little easier. His latest shop van sports a painted 1935 / 1936 Auburn Speedster on the side. This is actually Roberts fourth Speedster-Van. His first was in 1982. The latest one features bright photo prints of original Auburn Speedster trim and a custom two-tone paint scheme. 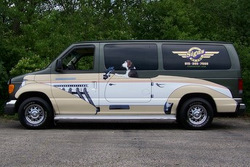 The three previous Speedster-Vans actually rode on the correct 127" wheelbase. This one is a little bigger, but that's OK, they say bigger is better. The Van Looks Great Robert! Thanks for the photo's. I am sure that the Dog is licensed, but I have One Question... where did the learn to Drive? The Ab Jenkins Exhibition of Speed Event, which has become k nown as, The Duesenberg Drag Races, took place this past Labor Day Weekend at the Auburn Cord Duesenberg Clubs National Reunion. This was the largest gathering of Duesenbergs ever, 71 cars were reported to have registered for the event with 43 of them participating in the Races. The event was professionally produced and filmed. DVD and Blu-Ray HD Video Preorders were taken the day of the event and of course I was right there in line “Please Take my Money! Please! My DVD arrived a couple of days before Christmas, that would be Christmas Eve–Eve around my house. I immediately took it for a test drive and was quite impressed. Over the Holidays I made sure that several visiting family members had to chance to view it, like it or not… how could you not like watching 45 minutes of Duesenbergs. I reluctantly had to turn down two WARM invitations to Florida during the COLD month of January, both offers were to Miami. One of the Miami trips included the Miami Beach Art Dec o Weekend celebration. I have been wanting to attend this event for the last couple of years. As always, too many places to go and too little time (and money) to do it all. "Selling Glamour and Style", was the theme for the 34th Annual Miami Beach Art Deco Weekend held January 14th – 16th 2011. A couple of my friends did make the trip and were kind enough to share their photos. 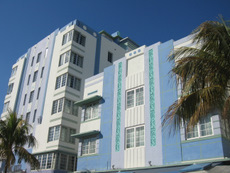 The event takes place on South Beach in the Historic Art Deco District between 5th and 15th street on Ocean Drive. Lining Ocean Drive over looking the Atlantic Ocean are Beautiful examples of Art Deco Hotels and Restaurants. The events include hotel tours, live music, vendors, guest speakers, a parade, and a Car Show on Sunday courtesy of the South Florida Region of the Antique Automobile Club of America (AACA). View Chrysler's Latest Commercial on You-Tube. I liked it, I bet you will too! "Back Home Again To Indiana"
My father said he would buy me a car if I would not smoke or drink until I graduated from Augusta Military Academy in Fort Defiance, Va., in 1946. I passed the test, so for $600 he bought me a 1936 Auburn Speedster from a neighbor across the lake in the Guilford College area, where I grew up. The Canary Yellow Speedster was built by the Auburn Cord Duesenberg Co. of Auburn, Indiana. My neighbor had bought it for his wife and said it had once belonged to actor Tyrone Power, who starred in films such as "The Mark of Zorro" in 1940. I drove the supercharged Auburn around town. It had a straight-eight engine and could go well over 100 mph. It went with me to the William R. Moore College of Technology in Memphis, Tenn., where I went to study the lumber industry in 1948. When I joined the Navy in 1950, I drove the Auburn to Atlantic City, N.J., where I was stationed. In 1954, I wanted to get married and needed $600 to purchase the engagement ring. So I sold the Auburn for the same price my father had paid for it. I now refer to it as the “triple faux paux,” as I no longer have the car or the wife, and missed out on $250,000, the amount an Auburn sold for at a recent auction. Russell G. Simmons leans on the 1936 Auburn Speedster that his father bought for him in 1946. The above story Courtesy of the News and Record (Greensboro, N.C.). I found it on one of their websites, TriadCars.com. Russell G. Simmons, 84, still lives in the Guilford College area of Greensboro. Does anyone know who may own Mr. Simmons Speedster now? After 50 years Glenn Prays collection of NOS Parts at his Auburn-Cord-Duesenberg Co. has finally been sorted and inventoried. Glenn bought the "Auburn-Cord-Duesenberg Co." from Dallas Winslow in 1960 with the intention of having an endless supply of parts for his Auburn and Cord restoration business. Mr. Winslow had purchased the Auburn Automobile Company in 1937, which included Cord and Duesenberg. Glenn Pray's purchase of the company is a story in its self. The book; "Glenn Pray - The Man Who Brought Legends to Life" tells it best. When Glenn Pray bought the ACD Company he not only purchased an estimated 600,000 - 700,000 pounds of original parts he also acquired the rights to three of the most recognized names in the world of Collector Cars; Auburn, Cord and Duesenberg. Tons of small parts were wrapped and packed into thousands of beer boxes. The boxed parts, sheet metal and trim were shipped from Auburn, Indiana to Broken Arrow, Oklahoma. Pray had set up a building (a former Pickle Factory) in Broken Arrow to start his newly acquired company. Parts were sold and used as needed for restorations, but the spare time and manpower needed to actually inventory everything that had been purchased was never available. Glenn's long time friend, Felix De Geyter, was hired in 1963 as the parts manager. When Felix left in 1966 he estimated there were still 400-500 boxes that had never been sorted. By then Glenn had started building the Second Generation Cords and his Auburn 866 Speedster was already in the planning stages. Again, the time needed to inventory parts wasn't there. was Blessed with Gorgeous weather; Sun, a Light Breeze and in the 70's. Guest enjoyed a display of 200 plus Collector Cars from across the United States and Canada. On exhibit were Classic Cars, Sports and Exotic Cars, Muscle Cars and Motorcycles. Special Displays included Antique Fire Engines, the 100th Anniversary celebration of the Indianapolis 500, the 50th Anniversary of the XKE Jaguar and an 85th Anniversary Iconic tribute to Route 66 with the most American of vehicles, the Station Wagon, entitled "Wagons Ho". Before the Sundays Concours, there is the Friday Night Country Club dinner and a Charity auction, Countryside Touring begins at noon on Saturday and ends with a Garage Party and Silent Auction that evening. Next Years featured Marque is "All-American Muscle", showcasing Vintage and Classic Muscle Cars along with a display of Vintage Dragsters and Wooden Boats. 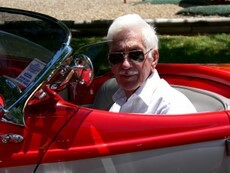 Mark your Calendars for the 2nd weekend in June for the 2012 Ault Park Concours d' Elegance. How’s this mix for a Road Trip; use one perfectly restored 1935 Auburn 851 Speedster add two very enthusiastic Auburn Cord Duesenberg Club members (man and wife at that) given the mission of "Crossing the USA and Back", sound like Heaven or … I would say Heaven. It is obvious that Mike and Joan Huffman felt the same way. 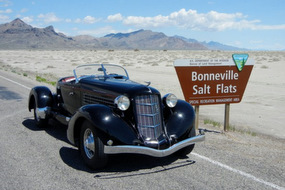 They have owned their Auburn Speedster, known as "Blackie" for many years. Mike is responsible for the Beautiful Condition that the car is in today. Their Auburn is a regular at many ACD Club events throughout the year. The trip began in their home state of Michigan on April 5th at 9:00 in the morning, it would be completed 52 days and 9716 miles later. The Florida ACD Club Citrus Meet being their first planned stop. Their next destination was to travel northwest so that they could take in the St. Louis ACD Club meet. Using back roads, including the Mother Road - Historic Route 66 when ever possible, Mike and Joan continued west with plans to see Yosemite, Rocky Mountain and Redwood National Parks along with stops in Reno, Vegas and the Bonneville Salt Flats. With a trip like this it's a no-brainer to visit as many Automobile Museums along the way and they did just that. Visits included; The National Automobile Museum's Harrah Collection, The Blackhawk Museum and The Imperial Palace Auto Collections. One of the many unique elements of this trip was that Joan kept a travel log, with photo’s, and posted it on the ACD Clubs website as the trip progressed. You can read in detail about their journey and view the many great photo’s of Joan, Mike and Blackie along the way by visiting the ACD Club website. New for this years ACD Club National Reunion was the addition of "Reunion Ambassadors". For those who have never att ended the annual Auburn Cord Duesenberg Festival / Reunion or those who have missed the last several meets the many available events can seem overwhelming. Now there are multiple Collector Car Auctions and New Swap Meets spread across the city of Auburn. Other events include an Antique Show, a Cruise Night in downtown Auburn, the traditional Friday morning ACD Club Parts Swap Meet held on the grounds of the original Auburn Automobile Company and the Saturday morning ACD Club's Car Show and Parade. The Reunion Ambassadors can help you plan your trip and hopefully answer some of your event questions. There are Ambassadors for the owners of the following cars; the 810/812 Cords, L29 Cord's, Auburn, Duesenberg and the Second Generation Auburn's, Cord's and Duesenberg's. Myself and my "Better Half", Shirley, were asked to be Ambassadors to this years Reunion for the owners of the Second Generation Cars. I hope that we were of some assistance to those that we spoke with. We enjoyed meeting and talking with everyone Saturday morning at Eckhart Park. Last month we traveled the Keeneland Concours d'Elegance, which is held in Lexington, Kentucky. I do not need to remind anyone that it has been a hot summer, so I felt blessed to start the day with cloudy sky's and an actual breeze. The Keeneland Concours d' Elegance celebrated it's 8th year, with Alfa Romeo as this years featured Marque. The event was held at Historic Keeneland Race Park. Keeneland itself Celebrated it's 75th year as a Premier Thoroughbred Horse Racing Course. Alfa Romeo's from across the United States were invited to participate. The Alfa Romeo Owners Club wisely selected this event to coincide with their 2011 National Convention. Along with the Alfa Romeo's, owners of other Classic and Exotic Cars from around the country brought their cars to be judged and displayed at this years Concours. There were 16 Classes with hundreds of cars competing for those coveted Blue Ribbons. Next Years Event will return to Keeneland, July 19th-22nd 2012, with Packard being the featured Marque. We have just returned from the Classic Car Capital of the World; Auburn, Indiana where we participated in the Auburn Cord Duesenberg (ACD) Festival and the ACD Club's National Reunion. I will be posting photo's just as soon as I can catch my breath. I have be en fortunate (and Busy) to have been able to attend so many Great Collector Car events this year. Last month myself and a long time buddy traveled to the Cadillac & LaSalle Club's Grand National Meet which was held in Columbus, Ohio. Not yet seeing any official numbers... I think that I am safe to Guesstimate 300-400 Cadillac's and LaSalle's were in attendance. The meet began mid-week with the Car Show and a Swap Meet being held throughout the day on Saturday. The weather for the Car Show was blessed with being just about perfect! I know the Big Guy has to drive an Auburn Speedster "Up There" but his back up car must be an Old Cadillac. The weekend before the Cadillac Meet I was in Michigan taking in two more shows. One being the Lincoln & Continental Owners Club's (LCOC) National Meet that was being held in Pontiac and the Concours d'Elegance of America that took place in Plymouth. The LCOC offered two days of road tours which included Automobile Museums, a Ford Assembly Plant tour and a trip to the Ford Proving Grounds. The meet concluded with a Saturday morning Car Show. Approximately 125 Classic Lincolns and Continentals were proudly displayed. The Concours d'Elegance of America was held at the Inn at St. Johns. World Class Auburn's, Cord's and Duesenberg's were just a few of the marques that were displayed on the fairways and greens of the Inn. This is the new location for the Concours d'Elegance of America. For more than 30 years the Concours was held at Meadow Brook Hall in Auburn Hills, Michigan. I have attended the Meadow Brook Concours for years and had reservations about anyone making changes to an already Successful Event. My fears were soon put to rest upon arrival. The Inn at St. Johns sits on 197 acres and is rich in history. Before the attaching luxury hotel and resort status, St. Johns was a Catholic Seminary in the 1940's. The Seminary closed in 1988. Ten years later $11 million was spent to bring the Inn up to its current condition. I am sure that the decision to move the event did not come easily, but the new location not only offers handsomely landscaped grounds but provides an on site hotel, restaurant, conference center and room for future expansion. Visit our Road Trips page for photo's of our most recent travels, listed above, and many others. The Auburn Cord Duesenberg Club celebrated it's 56th Annual Reunion in Auburn, Indiana over the long Labor Day weekend. 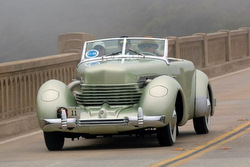 Thi s year also marks the 75th Anniversary of the 810 Cord. The Iconic American Classic's popularity is probably stronger today than it was 75 years ago. Front Wheel Drive, Unit-Body Construction, No Running Boards, Hidden Radiator, Disappearing Headlights and a Gordon Buehrig Styled body were just a few of the Modern if not Futuristic Styling and Mechanical features of the 1936 and 1937 Cords. Many of these new Cord features would not be seen on other cars for decades. Earlier this year invitations went out to owners of 1936 and 1937 Cords to participate in the “Back Home Again to Indiana” Convoy. This all Cord touring event was coordinated by Auburn Cord Duesenberg Club Members Bob Coleman and Josh Malks, The tour was designed to be able to leave from Any Place USA and join the Back Home Again Convoy at designated meeting points. Participating Cords all arrived at this years Reunion together. The Glenn Pray Auburn Cord Group paid tribute to the late Glenn Pray over the L abor Day weekend at this years Auburn Cord Duesenberg Festival. There was a Thursday evening get together at Oscar Roberts restored Sinclair Service Station / Museum and an early Friday night dinner with Glenn's family before heading downtown to the Auburn Hotel and Town Square for the traditional ACD Club's 9th Street gathering. On Saturday morning many of Glenn's Second Generation Auburn's and Cords were displayed in Eckhart Park along with hundreds of Auburn, Cord and Duesenberg automobiles as part of the ACD Clubs 56th Reunion. The Saturday Car Show and Parade was open to the public again this year. 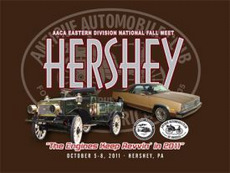 AACA Hershey Fall Meet - It was Sweet! 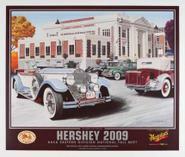 They say Hershey, Pennsylvania is the "Sweetest Place on Earth" if you Love Chocolate and Old Cars... They, (who ever "They" are...) also say that "All Roads Lead to Hershey". From the thousands of Old Car Enthusiasts that show up each year I believe it. My 1st trip to Hershey was in 1973. My Dad had purchased a new Cadillac Sedan DeVille earlier that year and he was anxious to get it out on the Road. That sounded like a good idea to me. I was 16 years old and armed with a fresh Drivers License. I could hardly wait to get behind the wheel of the Caddy. Our Nations New 55 mph Speed Limit was in effect and while everyone else in the country was cursing the new law, driving at 55 mph was pretty exciting for a 16 year old kid. Upon arriving in Hershey we were greeted with Rain, lots of Rain. The forecast for the entire weekend was Rain. Our First day was spent waiting for a break in the weather, which never happened. By day Two, my Dad and I could not stand it any longer. Armed with umbrella's only, we experienced our 1st Hershey Show... in the Rain and Mud, lots of Mud. I have attended Hershey many times since and have experienced every thing that Mother Nature has to offer, Good and Bad. This years Show was Blessed with Sunshine, a Clear Sky and Wonder Fall Temperatures. Hershey was definitely the "Sweetest Place on Earth" this year. As always, I snapped plenty of Sweet Photo's. Take a Look! California Custom Coach, creator of the Auburn 876 Speedster, built turn key cars and offered kits in the 1970's and 80's. They were located in the Pasadena, California area. During that time a young man living in Geneva, Switzerland, Alex Christodulidis, was quite taken by the California Custom Coach 876 Speedsters Classic Car styling and the modern conveniences that were being built into them. 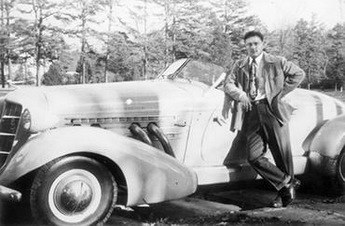 He dreamed of someday owning an 876 Auburn Speedster, but he never dreamed of one day owning the Company. Fast Forward to 2010, Alex would learn that the California Custom Coach company, with it's patterns, molds, hundreds of blue prints and a large inventory of unused parts was being offered for sale. He did not hesitate, he bought all of it and immediately started a plan to put his dream car back into production. The tradition continues, but now in North Texas. California Custom Coach (CCC) is back. They are again offering factory built Speedsters and parts for owners of existing 876 Auburns. From recent conversations with the new owners I can tell that they are excited and very enthusiastic with the companies start up. Their goal is to offer a world class automobile. You can read more about the New California Custom Coach company and their New Auburn at www.california-custom-coach.com They have just recently added a video of their new car in motion. It looks Great! Check it out.